Snelling Course Closes; Student Await Glad News ------------------------------------------------- Announcement of Places Expected to Be Given Out Monday. ------------------------------------ MILITARY FIELD DAY PLEASES GOVERNORS ---------------------------------------- Executives of Iowa, North and South Dakota View Final Maneuvers. ------------ By JACK REMINGTON. With the closing the training course for embryo officers at Fort Snelling yesterday, the students who soon are to become real officers and drill masters for the draft army have settled down to the tiresome routine of awaiting the arrival of their commissions and assignments. It is expected the students will learn Monday whether they are to become officers of Uncle Sam's fighting forces at once. be recommended for further training at the second camp or be retired to civil life for the present with the idea later of becoming non-commissioned officers of the draft army. Checking up U.S. Property. The Snelling camp closes officially August 15, but the only task remaining for the student to accomplish is the checking up of property to be returned to the government prior to that date. Some companies have completed their property returns, and others will finish today or Monday. All the students will be paid for their last month's work in camp early next week.Nearly all the students will be given leave of absence for the week end today, but a few who insist their commissions are coming today assert they do not intend to wander far from camp. Captain Thomas C. Musgrave, examining officer in Minnesota for the second reserve officers' training camp. opening at Fort Snelling August 27, last night notified about 450 Minnesotans by mail that they have been accepted for training and are to report at Snelling on the opening day of the camp. The list of Minnesotans who have been accepted for the second camp will be announced by The Tribune this afternoon. 10,000 Watch Field Day. The closing day of the training course at Snelling yesterday was marked by a military field day which furnished the 10,000 spectators with as many thrills as a three-ring circus. The governors of Iowa and North and South Dakota and former Governor Van Sant of Minnesota were among the distinguished visitors, and the executives admitted they enjoyed the performance as keenly as the barefooted lad who hiked out to the fort from Minneaoplis to see the boys in khaki fight and drill. The day opened with a big trench maneuver in which the student army swept away every obstacle and left a trail of smoke and thrills in its wake. Following the battle the governors were escorted back to the post, where the noon mess was served in the first barracks. The distinguished visitors were served the same menu as the students, and they divided their time between eating and enjoying the sight of more than a hundred men of infantry Company I disposing of the "fruits of victory." Governors Inspect Camp. Following the noon mess the governors visited the barracks, inspecting the sleeping quarters, kitchens and study rooms. Later they paid a brief visit to the Y.M.C.A building. At 1:30 p.m. the students began a series of drills on the parade ground, exemplifying various phases of training which they have received the last three months. There were squad, company and battalion drills and semaphore signalling by the infantry, standing gun drill and mounted drill by the artillerymen, combat firing practice and bayonet exercise and combat by the cavalrymen. The artillery students showed the governors how the 3-inch field pieces are placed in position, sighted and fired, and several blank shells contributed to the din of the day. One of the novel stunts of the day was four games of football played simultaneously on a single field. The eight teams were composed of university students who have been taking the training course, and incidentally brushing up on football tactics under the direction of Dr. H.L. Williams. As there are several members of the All-American team in camp it may be said the games were decidedly interesting. Football stars who receive commissions are to organize football teams in the draft army camps this fall in order to provide recreation for the soldiers. Intertainment for Guests. Following the drill period yesterday a reception was given the visiting executives and all officers at the post by Brig. Gen. and Mrs. William H. Sage at their residence. The thirty-sixth U.S. Infantry band played several selections during the reception. At 5 p.m. the governors took up their position on the parade ground in front of the Officers' club while the entire student regiment passed in review. The infantry and cavalry led the parade and the artillery students, using the animals and field guns of the First Minnesota Field artillery, followed. It required nearly half an hour for the 2,000 students to pass the reviewing point. While spectators were cautioned not to applaud any of the organizations, it is significant that each (continued on page 9, Col. 1.) -------------------------------------- Minnesota Weather. ------ Partly cloudy today, probably followed by showers and cooler weather in west; tomorrow unsettled and cooler, probably showers in south. Training Camp Students Stage War Scenes in Honor of Governors 1.--Student Officers at Fort Snelling following up behind smoke bombs. 2.--Students in a trench built in five minutes. 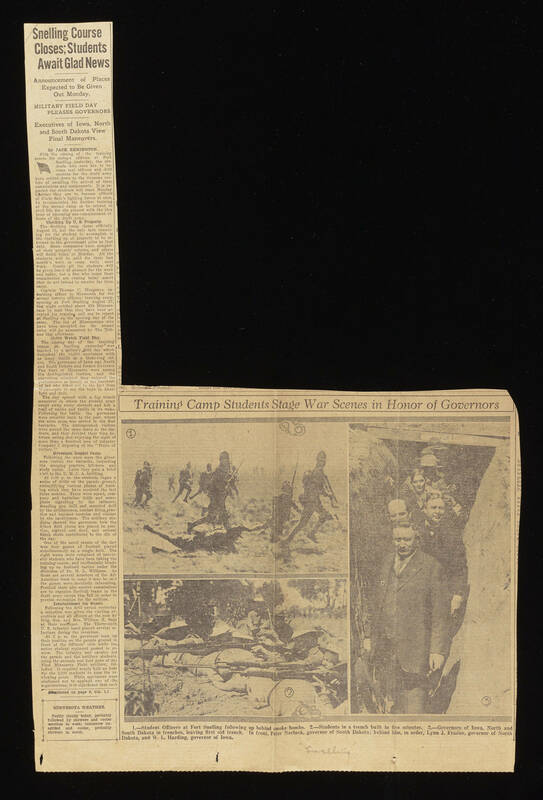 3.--Governors of Iowa, North and South Dakota in trenches, leaving first aid trench. In front, Peter Norbeck, governor of South Dakota; behind him, in order, Lynn J. Frazier, governor of North Dakota, and W.L. Harding, governor of Iowa.